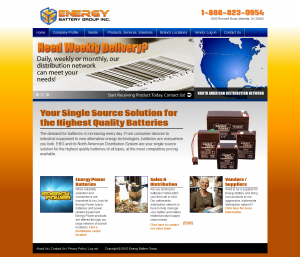 4word Systems is pleased to announce the launch of Energy Battery’s official Web site www.energybattery.com. After an extensive design and branding process, the team at 4word Systems was able to bring the power of Energy Battery and their Energy Power branded batteries to the Web. Energy Battery Group, Inc., is the largest, fastest growing, not-for-profit battery group in North America (and possibly the world). Their unique relationship with suppliers and the battery/power industry helps their distribution centers realize huge growth and huge profits. Learn more about the benefits of joining the Energy Battery Group by visiting www.energybattery.com or calling 1-888-823-0954. 4word systems is proud to be Energy Battery’s Web design, graphic design and development partner for over four years running.